We're still a few months away from the release of the Moogle-riffic sequel to Final Fantasy XIII, but that ain't stopping Square Enix from tantalizing fans with a beefy Collectors Edition. 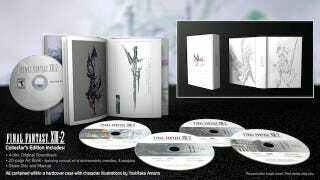 Plunking down the extra $20 dollars gets you a fancy sleeve illustrated by the legendary Yoshitaka Amano, along with a high-end concept art book and a four-disc official soundtrack set. Of course, there's pre-order incentives that vary depending on where you reserve the game. Do it at GameStop, you'll get an alternate costume for Serah. An Amazon pre-order gets you an exclusive boss battle against an enemy baddie called "Omega," who can joins your party later. Plunk down your cash at Best Buy and get the hardcover Final Fantasy XIII – Episode I novella, which bridges together the stories of XIII and XIII-2. Anyone interested in picking any of these up should note that they're exclusive to North America. Because Japan's probably getting something cooler.